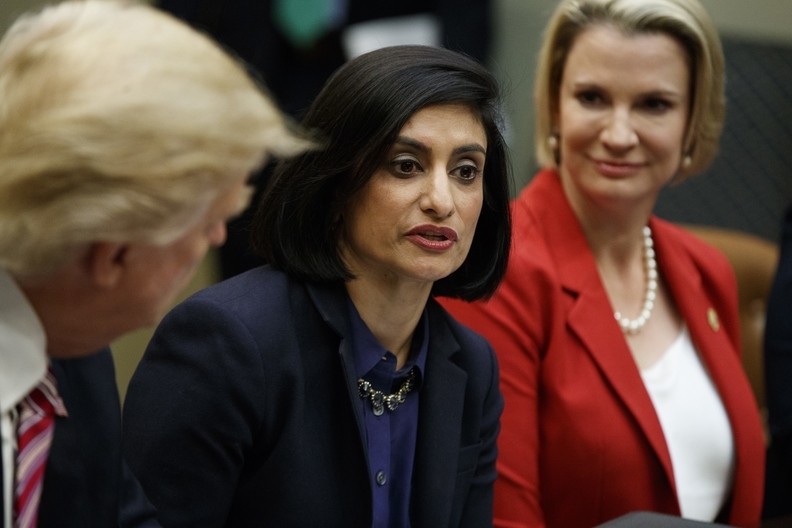 The CMS plans to convene an inter-agency group to figure out how to minimize the regulatory barriers of federal anti-kickback laws, which have slowed providers' move to value-based care, according to CMS Administrator Seema Verma. The CMS, HHS' Office of Inspector General, HHS' general counsel and the Justice Department will participate in the group. The agencies have heard providers' concerns over the years about the Stark law, which Congress passed in 1989. It "presents significant barriers to the implementation of these new innovative models that reward coordination and reward value," Rick Pollack, president of the American Hospital Association, told Verma during a webinar Wednesday. Verma said she is aware of the concerns and said it was one of the leading issues raised in response to various requests for information on how the CMS could reduce regulatory burden. It is also a key focus for Eric Hargan, HHS' acting secretary and a former healthcare attorney, Verma said. "I think the Stark law was developed a long time ago, and given where we're going in terms of modernizing (Medicare) and the payment systems we are operating under now, we need to bring along some of those regulations," Verma said. Hospitals have said the Stark law makes it difficult for physicians to enter innovative payment arrangements because they are not susceptible to fair-market value assessment, a Stark requirement. Stark also prohibits doctors from referring Medicare patients to hospitals, labs and colleagues with whom they have financial relationships unless they fall under certain exceptions. Physicians and hospitals can be found liable even if they didn't intend to violate the Stark law, and offenses can carry significant financial penalties. The law also prevents hospitals from paying providers more when they meet certain quality measures, such as reducing hospital-acquired infections, while paying less to those who miss the goals. Those are key tenets of value-based care. "We're committed to moving away from a fee-for-service system and toward one that favors value and outcomes," Verma said. Despite HHS' focus in reducing barriers regarding the law, Verma noted that Congress may ultimately need to intervene to make meaningful changes to the Stark law to reduce its effect on value-based care transitions. An edited version of this story can also be found in Modern Healthcare's Jan. 22 print edition.